Ross Kaplan began his riding career at the age of 6 at Jamaica Bay Riding Academy. After just a few lessons Ross was hooked. At the age of 8, he began his show career in the Short Stirrup Hunter aboard "Midnight Illusion". By age 13, Ross and his trainer Wendy Kaufman were purchasing talented young prospects and training them for the hunter ring. 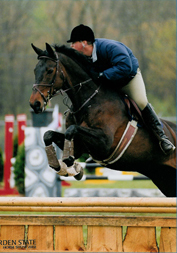 Ross's passion later turned to the jumper ring where he successfully competed at many prestigious shows such as the Hampton Classic, Garden State, and HITS. Ross brings to his teaching passion, enthusiasm and years of knowledge built with the help of many great horsemen such as Jimmy Rice, Michael Page, Kevin Babbington and Greg Best. Ross began his professional career in 1999 at the Thomas School of Horsemanship. In 2001, he was hired as assistant head trainer at Hartman Hill Farm. In 2004, Ross moved to Brookville, NY and opened Sagamore Hill Stables. A full service training facility, that offers professional instruction for Hunter, Jumper and Equitation riders. In 2014 Ross moved his operation to Stanhope Stables in Huntington, NY. This facility offered Sagamore Hill Stables a larger indoor riding space, improved footing in all the arenas and space for the program to grow. In 2014 and 2015 Ross coached "Virtue" and rider Elizabeth Klett to HOTY in the Childrens Hunter Horse Division, Santos Wannabee and Rider Aurelie Guss to USHJA Stirrup Cup Champion, and Carina MY Ballerina and Miranda Leibstein to USHJA Stirrup Cup Champion. Ross continues to teach at his current location and coach his students to series awards at local horse shows, tri-color ribbons at national and zone competitions and finals. Lisa Kaplan began her riding career at the age of 3, when she would ride Western with her grandfather. By the time she was 8 years old, Lisa decided to switch into the hunter/jumper world. She rode on her high school equestrian team at Sacred Heart Academy and was a team captain for three years. 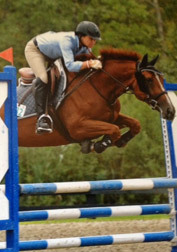 Lisa continued her riding career at Lynchburg College in Virginia, where she competed in the IHSA. Lisa joined the Sagamore Hill Family in 2006, as a rider and competitor in the equitation. She won many tri-colors in the adult equitation at local and A-rated horse shows. Lisa went on to qualify for Marshall and Sterling Finals for the Bit O'Straw and the Adult Medal. Lisa has a Master's Degree in Education and has many years working with children both in the classroom and outside of the classroom. After spending a few years as a substitute teacher, Lisa realized that her passion was in the riding arena and decided to become a full time trainer. Lisa has coached many of her students to tri-colors at horse shows throughout the zone and numerous year end awards. She is also one of our IEA coaches. Jennifer Henick has spent over 30 years in the saddle. As a junior she spent her years competing and training with many top professionals. Jen spent her college years riding for the LIU Post team and working for Jim Rice. Upon graduation she became the head coach for the LIU Post Equestrian program. Throughout the last 18 years as their coach Jen has been able to qualify her riders to compete at the IHSA National Level on several occasions. 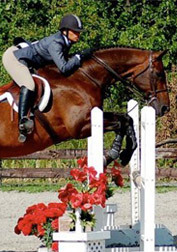 Currently Jen is coaching the Adelphi University Equestrian Team for Sagamore Hill and also has the pleasure of training riders of all ages and abilities in private lessons. She also takes great pride in training and riding our horses and helping us prepare them for the show ring. Kimberly Sarrica Born in October of 1994 the start of her riding career didn't begin until 2006, in St. James, N.Y. where she was fortunate enough to ride ponies and start showing, earning championships on Long Island and A rated horse shows. From cross rails to the 3'6 equitation she rode with John Colon, her trainer and mentor. In 2007 and 2008 she successfully showed in the pony divisions winning the pony medal at M&S League Finals. The following year she earned 5th at M&S League Finals for the 3'6 medal on her junior jumper. She qualified and competed in the same year for the pha, USEF Medal Finals and ASPCA Maclay Regionals. Kimberly spent majority of her junior years as a working student for Brooke Chasin at North Shore Equestrian Center, where she had the opportunity to ride and show green horses. In 2012 she rode a young horse to second place at HITS Saugerties in the $1500 Diamond Mills Hunter Prix. 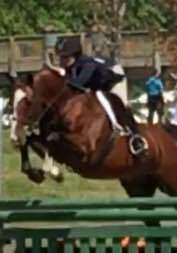 She was champion in the non- professional and children's hunter division at the Hampton Classic Horse Show, ending the year at Zone 2 Hunter Finals with him. The end of the summer of 2014 she joined Sagamore Hill, where she spends a lot of time in the saddle, whether it be in the schooling or show ring, and also working and coaching riders of all ages. Sagamore Hill Stables is a full-service boarding, training and show barn. Our program teaches riders of all abilities and ages with a focus towards the show ring. The most important members of our team are our horses. Click below to meet our equine educators. Sagamore Hill Stables is home to many accomplished and talented riders. Click below to meet our boarders. © 2008–2019 Sagamore Hill Stables. All Rights Reserved.